Sumptuous Chocolate Truffles available exclusively at David Jones. 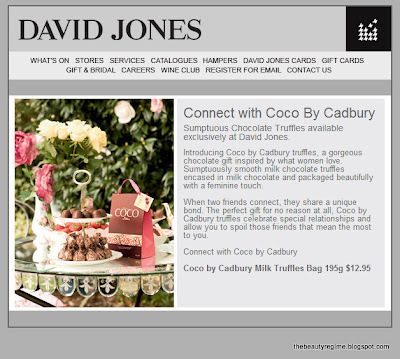 Introducing Coco by Cadbury truffles, a gorgeous chocolate gift inspired by what women love. Sumptuously smooth milk chocolate truffles encased in milk chocolate and packaged beautifully with a feminine touch. When two friends connect, they share a unique bond. The perfect gift for no reason at all, Coco by Cadbury truffles celebrate special relationships and allow you to spoil those friends that mean the most to you.